This past Sunday was rainy and therefore perfectly suited to and perfectly timed for pickling. Cucumbers and peppers are in their prime right now in New England, garlic picked a few weeks ago is sun-cured and ready to use, and the farmers’ market was selling dill by the bundles this weekend. What better way to spend a rainy summer Sunday than preserving summer produce for the not-so-summery months ahead? Not all of my peppers have ripened, and only a handful or so of my cucumbers were available for pickling, but I had enough to make a half batch of each — a fine amount for my small household. 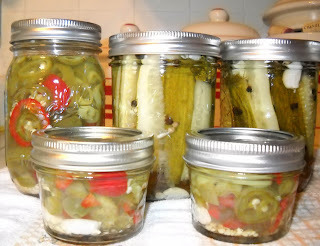 I used the Pickled Chili Peppers and Dill Spears recipes from Sherri Brooks Vinton’s Put ’em Up! with slight modifications. Please note that I did not modify the amount of brine! The right acidity is very important when preserving food. What I did modify in the dill spears recipe was the amount of garlic and peppercorns (extra of both to suit my tastes! ), and I used fresh dill rather than dill seeds. And in the pickled chilies recipe, I added garlic cloves even though they were not called for. I'm going to bank on the fact that I am not the only one with cucumbers and peppers ready for harvest. And I highly recommend preserving some of these summer treasures for the colder months ahead. If you are a fan of spicy-hot, as I am, the pickled chili peppers make great nacho toppings — a perfect fit for football-season snacking. The recipe for pickling chili peppers is also one of the fastest, easiest preserving recipes you can find. If you are a newbie to canning, this is a perfect recipe to get started with. The sweet-sour brine mellows the chilies so you can strew them liberally on a pizza, roll them into a burrito, or chop them into your morning eggs for a lot of flavor and a touch of heat. Pack the peppers into 4 clean, hot pint-size canning jars, leaving 1/2 inch of headspace. Combine the vinegar, water, salt, and sugar in a medium nonreactive saucepan, and bring just to a boil. Pour the hot brine over the peppers to cover by 1/4 inch. Leave 1/4 inch of headspace between the top of the liquid and the lid. Refrigerate: Cool, cover, and refrigerate for up to 3 weeks. Can: Use the boiling-water method. Release trapped air*. Wipe the rims clean; center lids on the jars and screw on jar bands. Process for 15 minutes. Turn off heat, remove canner lid, and let jars rest in the water for 5 minutes. Remove jars and set aside for 24 hours. Check seals, then store in a cool, dark place for up to 1 year. * Use a utensil (if you buy a canning kit, it comes with a specific utensil, but a butter knife, spoon or fork end, chop stick, etc. will work just as well) and swirl it around the jar to release any air bubbles before you put the lid on and drop it in the boiling water. Learn from the author herself! Sherri Brooks Vinton, author of Put ’em Up!, will be doing canning workshops in the Berkshires put on by Berkshire Grown. Led by Sherri Brooks Vinton, author of Put ’em Up! RSVP by August 22 at sarah@gramercybistro.com or 413.663.5300. RSVP by August 22 at info@thenutritioncenter.org or 413.429.8110.